Makhathini, who currently works as an Academic Development Officer in the School of Laboratory Medicine, says he is looking forward to this year’s Canadian IBRO-USCRC School of Neuroscience gathering titled: Neural Circuits and Plasticity in Health and Disease, where he hopes to establish connections for his post-doctoral Fellowship programme. His PhD thesis was on human immunodeficiency virus type 1 (HIV-1) which is a major health threat in South Africa and worldwide. Studies have shown that HIV affects the central nervous system (CNS), and can initiate a progressive neurodegenerative process culminating in HIV-associated dementia. In Makhathini’s research, tat protein was injected into the hippocampus of rats as a model to investigate HIV-associated neurotoxic effects. Since many people living with HIV often find themselves subjected to harsh environments, the study used restrain stress to mimic these conditions and to investigate whether exposure to stressful conditions would exacerbate the neurotoxic effects of tat protein in the brain. The continued reporting by clinicians of HIV-associated neurocognitive abnormalities in HIV-infected people – pertinent in the face of the current roll-out of antiretroviral treatment – indicates that existing HIV management remains only effective in controlling peripheral symptoms, but fails to address CNS impairments to the same level of success. 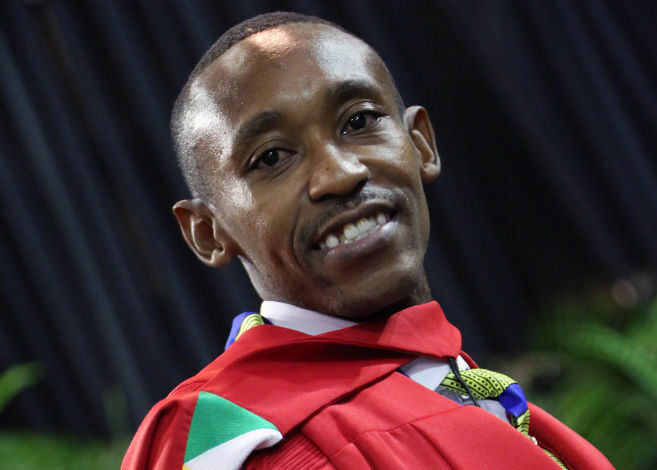 Makhathini’s study assessed the therapeutic potential of rosmarinic acid in reversing the toxic effects of tat protein in the rat model of HIV-related brain malfunctioning. Findings showed that repetitive stress induces neurocognitive and anxiety-like behavioral changes that were associated with alterations in the functioning of the hypothalamus-pituitary-adrenal (HPA) axis, a decrease in hippocampal neurotrophic factor concentration, and significant changes in hippocampal DNA methylation status. Injecting tat protein into the hippocampi of rats produced similar behavioural changes to repetitive stress as seen in the dysregulation of the HPA axis and the activation of a pro-inflammatory immune response. Interestingly subjecting tat-treated animals to stress had a moderate effect with only the TNF-a release being further increased. Treatment with rosmarinic acid showed a promising anxiolytic effect and significantly reduced the toxicity of tat protein, suggesting that this plant extract could be considered as adjunct treatment in the management of HIV.